These mozzarella sticks come out of the oil crunchy, gooey and just about perfect. My husband, who enjoys his share of mozzarella sticks when we go out, enjoys these just as much. I think they're even better. Don't skimp or extend the freezer waiting time, though, 30 minutes is perfect to keep the cheese gooey, but inside of the breading. If you do want to make them ahead of time and store them in the freezer, they are best when they are allowed to sit out 15-30 minutes before frying. Slice the string cheese in half. Place the flour in a small bowl. In another separate bowl, combine the bread crumbs with the parsley, salt, pepper, and garlic. In a shallow dish, whisk the eggs with the milk to combine. To assemble, one by one, dust the cheese in the flour, tapping the excess off. Next, dip the cheese in the egg mixture, covering completely. Then lastly, roll the cheese in the panko crumb mixture. Gently remove and place on a baking sheet. Place the sheet in the freezer for 20 to 30 minutes to flash freeze. When hot, add the mozzarella sticks, a few pieces at a time. Don't overcrowd your pan, or you'll lower the temperature of the oil too much, that will result in your mozzarella sticks absorbing too much oil. Watch closely and turn over to evenly brown, cooking less than 2 minutes. Do not allow the cheese to bubble and leak. Remove and drain on a paper towel-lined plate. Serve with warm marinara sauce, if desired. I love salsa fresca...just some veggies thrown together in the food processor, with the addition of a lot of lime juice. I prefer my salsa very "limey", and a fairly smooth consistency. I like that this everything in this salsa is small, and the great thing about recipes like this - you can totally adjust the ingredients to your own taste. Not enough onion? Add more. Too much lime? Use less. The heat of the salsa depends on how many serrano peppers you use. Or you could use jalapeños, or I suppose even habaneros, it's completely up to you. I like mine pretty hot, so I used 3 serranos. Start with one, you can always taste it and add more. Enjoy! Add the cilantro, onion, garlic, and peppers to a food processor or blender. Process until smooth, then add remaning ingredients. Process until it reaches your desired consistency. Taste, adjust seasonings, serve with tortilla chips. This is really more of a method than an actual recipe, but these stuffed squash are a great way to use up leftovers that are hanging around in your fridge. They can be made with any variety of summer squash, but I love the shape of the pattypan squash, they're too cute. This recipe would work for either a side or main dish. Change up the fillings as you see fit...use orzo or quinoa in place of the rice, ground beef instead of sausage, parmesan or monterey jack in place of manchego...you can do just about anything once you have the method down! Add about 3 inches of water to a pot or saucepan with a lid, lightly salt the walter and bring to a boil. Add the squash to the boiling water and allow to cook for about 10 minutes, or until the squash is fork tender. Remove the squash and allow it to cool. Meanwhile, bring the chicken broth to a boil, then add rice. Simmer until liquid is absorbed and the rice is tender. Drain the water from the pot that had the squash and heat up a little oil over medium heat. Saute the onion until tender. In a bowl, combine the cooked rice, onion, sausage, cheese and red pepper. Remove the tops of the squash and scoop out some of the flesh inside, trying not to cut all the way through the squash. (If you do, it's okay, the filling is dense enough it shouldn't cause any mess...not that I'd know...) If you choose to add some of the scooped out flesh to the filling, squeeze out the excess water. Check your filling for seasoning and add salt and pepper as desired. Stuff the squash with the filling, mounding a little on top as well. Spray a baking dish with a little nonstick spray and place the filled squash inside. Bake in preheated oven for 20 minutes or until everything is warmed through and the squash is very tender. **You could more than likely use this filling to stuff bell peppers as well, just add about 1/2 inch of hot water to the baking dish before baking them. I made this tasty dip last week for a weekly gathering we have with folks from our church. Five of us nearly finished off the entire dish, it was that good! I used my hummus recipe, but feel free to use store-bought as well. We had pita chips, cucumbers and bell peppers to dip it in. Just for fun, I topped a lamb burger with the leftovers later in the week, and it was phenomenal. Just the right thing to go with that burger. 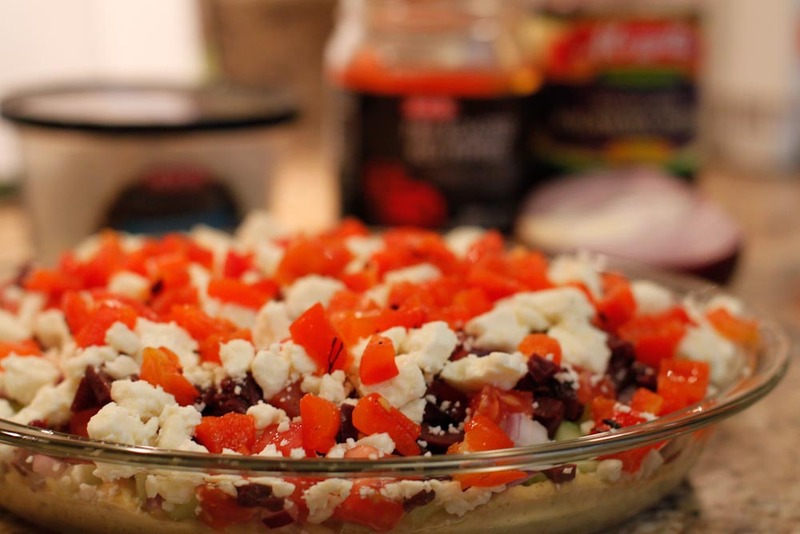 In a 9-x-13 inch baking dish (or any other serving dish), spread the hummus in an even layer. Add layers in the following order: cucumber, onions, tomatoes, olives, feta cheese, and roasted red bell pepper. Serve with pita chips and/or fresh vegetables. **I gave measurements here, but when I made the dip, I simply put on as much as looked good. I used the entire batch of hummus. These little tenderloin steaks have a tasty garlic sauce that would taste good on any number of other foods as well. This recipe comes from a great little book from Cooking Light, called Light and Easy Menus, that contains menus, something I'm not the best at putting together myself. I have a hard time coming up with creative sides that go well with a main dish. I love the menus in this book and since it's from Cooking Light, I feel like I'm making good choices. 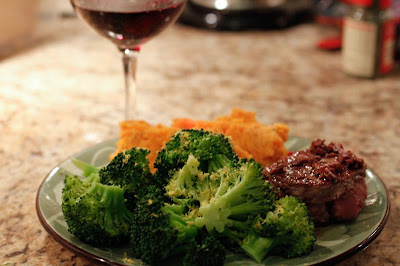 The steaks weigh in at 190 calories each, the sweet potatoes at 163 per serving and the broccoli at a whole 33 calories per serving! Combine first 5 ingredients and juniper berries, if desired. Set aside. Press 1/4 teaspoon salt and pepper evenly onto steaks. Heat a heavy skillet over high heat until hot. Place steaks in pan; cook 3 minutes on each side or to desired degree of doneness. Transfer steaks to a plate; keep warm. What to eat for breakfast on a warm, muggy Texas morning in the fall? 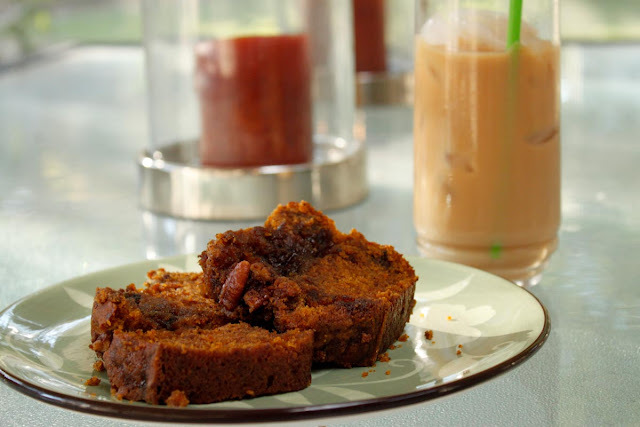 Pumpkin bread and iced coffee...yum! Okay, so the bread is almost more of a cake than a bread, but the streusel topping is amazing. I toasted my slices of bread and then put some butter on and it was a perfect fall breakfast. Cinnamon, cloves, nutmeg and pecans...and brown sugar and butter. Divine. And all accompanied by the Pioneer Woman's recipe for iced coffee. Enjoy! To Toast the Pecans: Preheat the oven to 350 degrees F. Place the pecans on a baking sheet, and toast them in the oven for 5 minutes. Set aside 1/2 cup of the toasted pecans for the topping. To Make the Bread: Grease two 9 by 5-inch loaf pans or 36 standard-size muffin cups with butter or nonstick spray. In a large bowl, stir together the oil and sugar. Add the eggs, pumpkin and water, and whisk until combined. Stir in the flour, baking soda, spices and salt just until combined. Gently stir in 1 cup pecan pieces. To Make the Topping: Stir the sugar, butter, cinnamon and the reserved 1/2 cup of pecan pieces in a medium bowl. Sprinkle the topping over the loaves or muffins before baking. I'm not the biggest fan of sugar cookies...frankly, when it comes to cookies, I like them with as much chocolate as I can squeeze into them. My husband, however, prefers sugar cookies above all others, and I love being able to bake things for him. So, when I came across this recipe, I figured it was worth a try. And was I ever right. The cookies are soft and stay that way for days afterward. My husband sticks them in the microwave for a few seconds just to warm them. I think these cookies are great, right up there with a lot of the chocolate recipes I love them...and my husband thinks they're just plain awesome. Enjoy! Heat 10 tbsp butter in medium sized skillet over medium high heat until melted. Continue cooking for about 2 minutes, or until butter is dark golden brown. Remove from heat and put in the mixer's bowl. Add rest of butter and set aside to melt. Preheat oven to 350 degrees. Line 2 baking sheets with parchment paper. In small bowl or dish combine granulated sugar and ¼ cup brown sugar and mix well. In small bowl, combine flour, baking soda and baking powder. Combine remaining brown sugar and salt in bowl with butter and mix for about 30 seconds, until mixture is free of lumps. Add egg, egg yolk and vanilla and mix until fully incorporated, making sure to scrape down sides of bowl. Add flour mixture slowly, stirring until just mixed, about 1 minute. Scrape sides of bowl and give one final stir to ensure everything's blended. center there should be some resistance and leave a slight indent.